Designed for today’s common MSR/AR and bolt action platforms, the TANGO4 3 – 12×42 mm riflescope is the ideal solution for mid to long range tactical engagements, designated marksmen and hunting with 4x times optical zoom and illumination in a 30mm one-piece maintube. Low dispersion (LD) glass provides industry leading optical clarity for any situation. 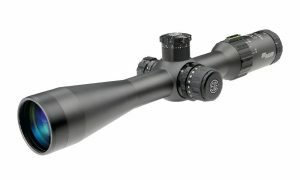 Offered in first focal plane (FFP) with multiple, illuminated reticle options. Dependable waterproof (IPX-7 rated for complete immersion up to 1 meter) and fog-proof performance.